Please follow these instructions to download the programs to your computer. If you have any problems, please contact customer service. NOTE: You need Adobe Reader installed on your computer. Most computers come with Adobe’s free reader already installed. However, if you try to open the file and you get a blank screen, please download Adobe’s free reader program and then try to open them again. Click here to download Adobe’s FREE PDF reader. IMPORTANT NOTE: For easy downloading, we recommend using Chrome. If you do not yet have Chrome, you can get by CLICKING HERE. 2. Download will automatically begin to download. 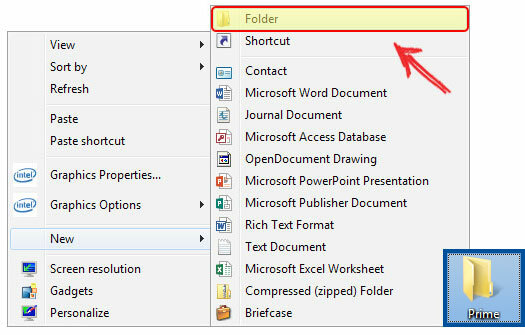 Create a folder on your computer where you can save the files. Right click on your desktop and choose Folder. We recommend naming the folder Prime. After you have created the Prime folder, right click (with your mouse or the right-handed button on your keypad) the download link. 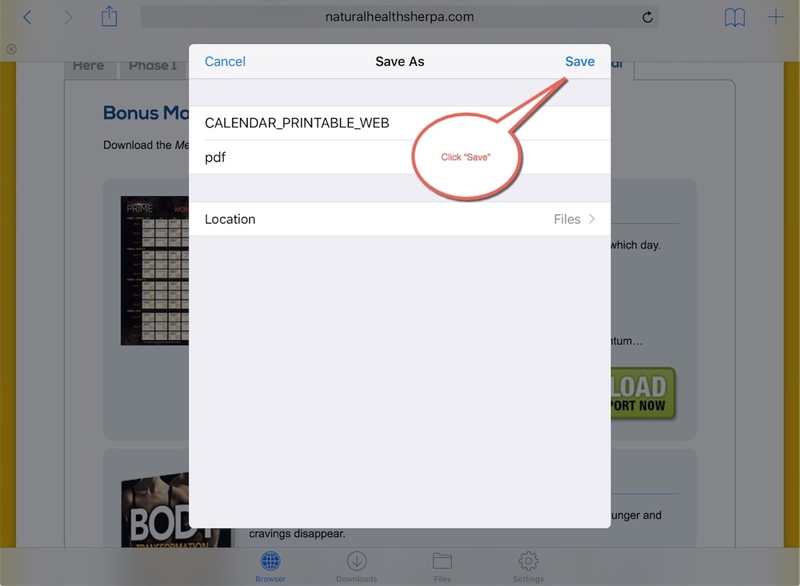 When a pop-up appears, choose Save Link As, or Save Target As. 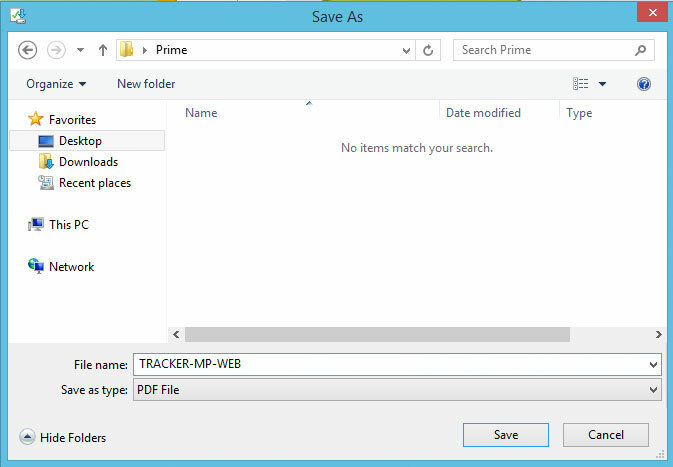 Save each of the files to your Prime folder. 1. Right click anywhere on the screen to view the menu. 2. Click on “Download Video As…” and follow the instructions. NOTE: The preferred browser for downloading is Chrome. 2. Click on “Save Video As…” and follow the instructions. NOTE: The preferred browser for downloading is Chrome. Download to your desktop/laptop then transfer to iTunes and watch them on your iPad there. Step #1: Download the videos to your laptop/desktop following the instructions above. Step #2: Move your files into iTunes. Drag your video onto the open iTunes window. Step #3: Sync your desktop/laptop iTunes with your iPad. Step #4: You will find the videos in the purple “iTunes Store” app under the movies section at the bottom of the screen. *Disclaimer: This is a 3rd-party app. 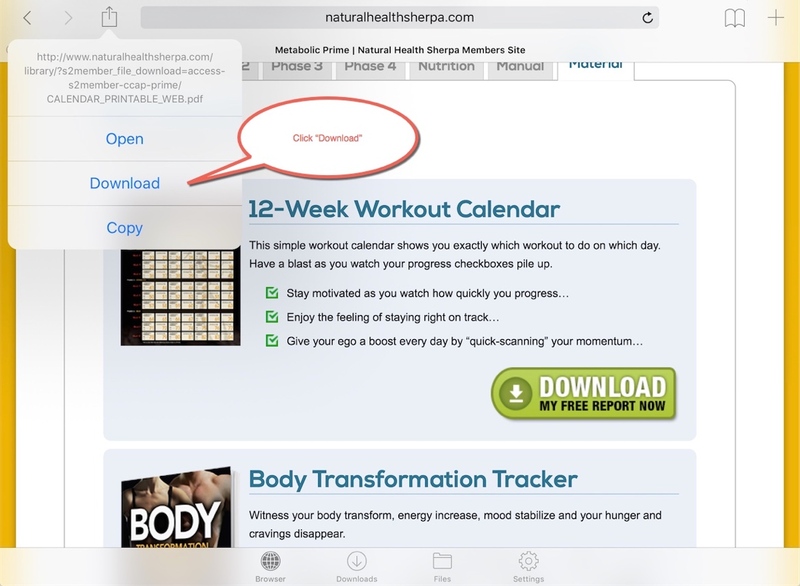 Natural Health Sherpa is not responsible for the content or actions of the app in any way shape or form. Step #1: Download the free app. Click on the blue “App Store” button on your iPad. Tap on the search box in the upper right-hand corner. 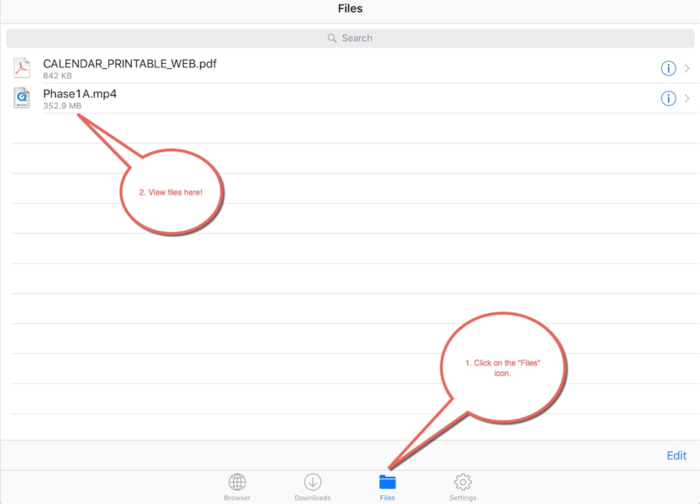 Step #2: Download the videos/PDFS. Click on the “Browser” link at the bottom. 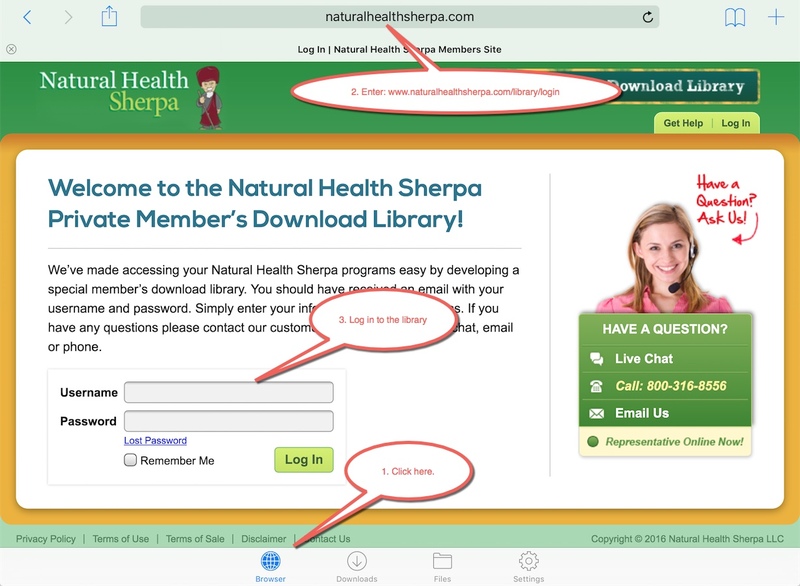 Enter in the url: www.naturalhealthsherpa.com/library/login. Go to the video/PDF that you would like to download. Be patient! Depending on your Internet connection and the size of the file, this could take some time to download. Step #3: View your files. 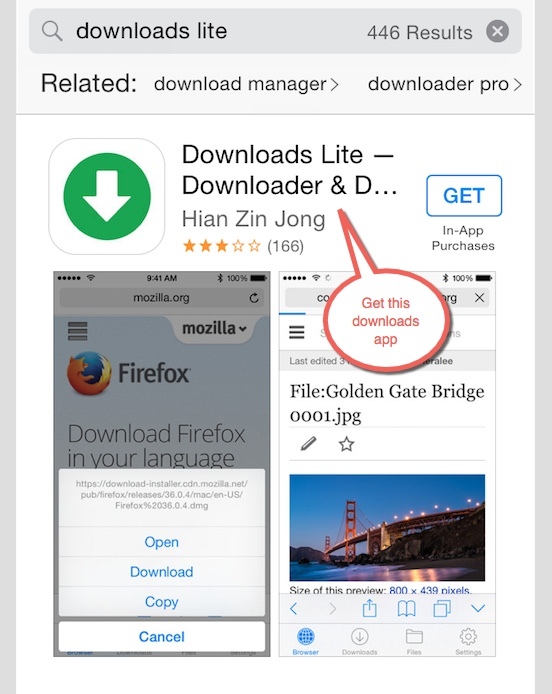 In the Downloads App, click on the “Files” icon at the bottom. Step #3: Sync your desktop/laptop iTunes with your devices. Step #4: You will find the videos in the purple “iTunes Store” app under the movies section at the bottom of the screen. Click on the blue “App Store” button on your iPhone. Step #2: Download the PDFs. 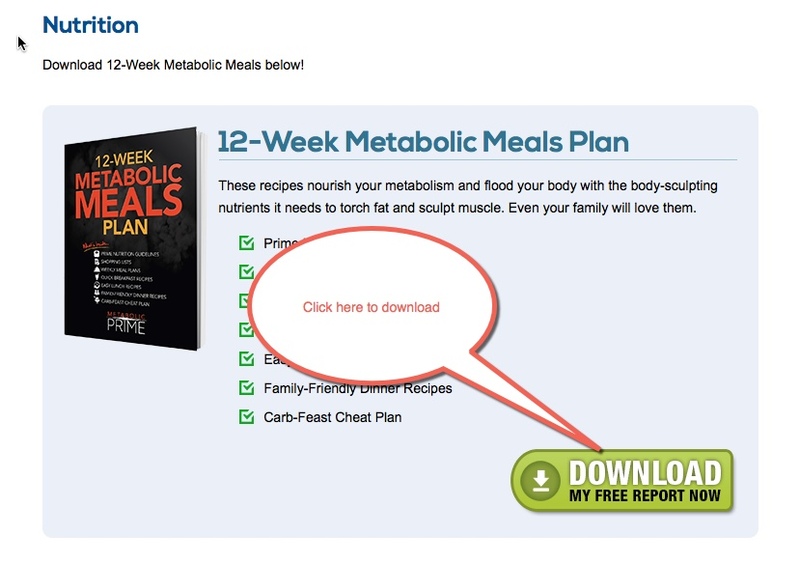 Go to the PDF that you would like to download.